The folding of space-time could create wormholes that could be used for faster-than-light journeys and time travel. Science fiction literature is full of stories in which tunnels in space-time — known as wormholes — are used for time travel. How much fact lies within the fiction? The answer is, more than you might think. Scientists are looking at ways to use traversable wormholes (if they exist) to travel faster than the speed of light — and even to travel through time itself. "A traversable wormhole is a hyperspace tunnel, also called a throat, that connects together two remotely distant regions within our universe, or two different universes — if other universes exist — or two different periods in time, as in time travel, or different dimensions of space," physicist Eric Davis told Space.com by email. Davis specializes in the field of space-time as a member of the Tau Zero Foundation, where he uses equations from Einstein's general theory of relativity to think about possible (or impossible) designs for traversable wormholes, warp drives and time machines. Wormholes were first proposed in 1916 by mathematician Ludwig Flamm, who was toying around with equations from Einstein's theory of general relativity that describe how gravity can curve space-time, which refers to the fabric of physical reality. While these tunnels through space-time are a fascinating theoretical possibility, according to physicist Kip Thorne, a professor emeritus at the California Institute of Technology, scientists have not yet come up with an agreed-upon way that wormholes could form in nature, and no wormholes have ever been detected. Thorne and some of his colleagues also showed that even if a wormhole appeared, it would likely collapse before an object (or person) could pass through it. To keep the wormhole open long enough to traverse it would require some kind of scaffolding, but normal matter wouldn't stand up to the job — it would require an "exotic material." "Dark energy is one form of naturally occurring exotic matter whose negative pressure produces the gravitationally repulsive force that pushes the space inside our universe outward, thus producing the inflationary expansion of the universe," Davis said. Along with dark energy, scientists also know of an exotic material called dark matter, which is five times more prevalent in the universe than regular matter. To date, scientists have been unable to directly detect either dark matter or dark energy, so much about them is still unknown. Scientists can learn about these materials, though, by examining the effect they have on the space around them. According to Ali Övgün of Eastern Mediterranean University in Cyprus, it's possible that wormholes could form where dark matter is present, and thus that they could exist in the outer regions of the Milky Way, where dark matter lies, as well as within other galaxies. Övgün is working to prove that wormholes could exist in regions dense with dark matter. He and his colleagues have run simulations that show that wormholes in dense regions of dark matter found in galactic halos would satisfy the physical requirements scientists think the tunnels require. "But it is only mathematical proof," Övgün said. "I hope one day it will be possible to also find direct experimental evidence." So, what happens to a person or instrument traveling through a wormhole? "Nothing! 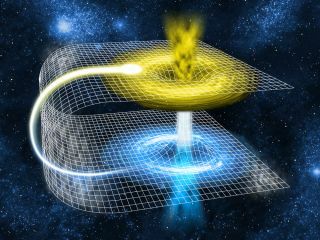 The space-time geometry of traversable wormholes requires that there be no nasty, intolerable gravitational tidal forces acting upon the spacecraft or its passengers while they move through the wormhole tunnel," Davis said. "They go into the throat at their departure location near Earth and get shunted through the tunnel to emerge out the other side near the destination star." Because these theoretical tunnels cut through space-time, they would allow travelers to achieve speeds that appear to an outside observer to be faster than light (FTL). However, from the travelers' points of view, they would never actually outpace the speed of light — it would just seem that way to outside observers because the travelers would be taking a route that's shorter than they would have taken through ordinary space. Before scientists could use wormholes, they would first have to find them. To date, wormholes have not been discovered. However, if they exist, locating a tunnel through space-time may not be as difficult as it sounds. "As it is visualized in the movie 'Interstellar,' in the future, there will be some experiments to observe [wormholes] indirectly," Övgün said. Based on certain wormhole theories, he compared peering through a wormhole to Alice's glimpse through the looking glass, in Lewis Carroll's novel of the same name. The region of space at the far end of the tunnel should stand out from the area around the entrance thanks to distortions that would be similar to the reflection in curved mirrors. Another indication may be the way light is concentrated as it moves through the wormhole tunnel, much as the wind blows through a physical tunnel. Davis refers to what is seen at the near end of a wormhole as a "rainbow caustic effect." Such effects could be seen from a distance. "Astronomers were planning to use telescopes to hunt for these rainbow caustics as a sign of a naturally occurring, or even an alien-made, traversable wormhole," Davis said. "I never heard if that project got off the ground." An artist's image of a hypothetical spacecraft that could be used to travel through a wormhole.